With vote tallies in for Egypt's first round of parliamentary elections it is abundantly clear that Egypt is on the fast track to becoming a totalitarian Islamic state. The first round of voting took place in Egypt's most liberal, cosmopolitan cities. And still the Muslim Brotherhood and the Salafists received more than 60 percent of the vote. Run-off elections for 52 seats will by all estimates increase their representation. And then in the months to come, Egyptian voters in the far more Islamist Nile Delta and Sinai will undoubtedly provide the forces of jihadist Islam with an even greater margin of victory. Until the US-supported overthrow of Hosni Mubarak, Egypt served as the anchor of the US alliance system in the Arab world. The Egyptian military is US-armed, US-trained and US-financed. The Suez Canal is among the most vital waterways in the world for the US Navy and the global economy. Due to Mubarak's commitment to stemming the tide of jihadist forces that threatened his regime, under his rule Egypt served as a major counter-terror hub in the US-led war against international jihad. Given Egypt's singular importance to US strategic interests in the Arab world, the Obama administration's response to the calamitous election results has been shocking. Rather than sound the alarm bells, US President Barack Obama has celebrated the results as a victory for "democracy." Rather than warn Egypt that it will face severe consequences if it completes its Islamist transformation, the Obama administration has turned its guns on the first country that will pay a price for Egypt's Islamic revolution: Israel. Speaking at the annual policy conclave in Washington sponsored by the leftist Brookings Institute's Saban Center for Middle East Policy, US Defense Secretary Leon Panetta and Secretary of State Hillary Clinton hammered Israel, the only real ally the US has left in the Middle East after Mubarak's fall. Clinton felt it necessary - in the name of democracy - to embrace the positions of Israel's radical Left against the majority of Israelis. The same Secretary of State that has heralded negotiations with the violent, fanatical misogynists of the Taliban; who has extolled Saudi Arabia where women are given ten lashes for driving, and whose State Department trained female-hating Muslim Brotherhood operatives in the lead-up to the current elections in Egypt accused Israel of repressing women's rights. The only state in the region where women are given full rights and legal protections became the focus of Clinton's righteous feminist wrath. In the IDF, as in the rest of the country, religious coercion is forbidden. Jewish law prohibits men from listening to women's voices in song. And recently, when a group of religious soldiers were presented with an IDF band that featured female vocalists, keeping faith with their Orthodox observance, they walked out of the auditorium. The vocalists were not barred from singing. They were not mistreated. They were simply not listened to. And as far as Clinton is concerned, this is proof that women in Israel are under attack. Barred by law from forcing their soldiers to spurn their religious obligations, IDF commanders were guilty of crimes against democracy for allowing the troops to exit the hall. Clinton didn't end her diatribe with the IDF's supposed war against women. She continued her onslaught by proclaiming that Israel is taking a knife to democracy by permitting its legislators to legislate laws that she doesn't like. The legislative initiatives that provoked the ire of the US Secretary of State are the bills now under discussion which seek to curtail the ability of foreign governments to subvert Israel's elected government by funding non-representative, anti-Israel political NGOs like B'Tselem and Peace Now. In attacking Israel in the way she did, Clinton showed that she holds Israel to a unique standard of behavior. Whereas fellow Western democracies are within their rights when they undertake initiatives like banning Islamic headdresses from the public square, Israel is a criminal state for affording Jewish soldiers freedom of religion. Whereas the Taliban, who enslave women and girls in the most unspeakable fashion are worthy interlocutors, and the Egyptian Muslim Brotherhood, which supports universal female genital mutilation is moderate, Israel is an enemy of democracy for seeking to preserve the government's ability to adopt policies that advance the country's interests. The unique standard to which Clinton holds the Jewish state is the standard of human perfection. Clinton's assault on Israeli democracy and society came a day after Panetta attacked Israel's handling of its strategic challenges. Whereas Clinton attacked Israel's moral fiber, Panetta judged Israel responsible for every negative development in the regional landscape. Panetta demanded that Israel make renewed gestures as well to appease the Egyptians, Turks and Jordanians. He failed to notice that it was Turkey's Islamist government, not Israel, that took a knife to the Turkish-Israeli strategic alliance. As for Egypt, rather than recognize the strategic implications for the US and Israel alike of Egypt's transformation into an Islamic state, the US Defense Secretary demanded that Israel ingratiate itself with Egypt's military junta. Thanks in large part to the Obama administration, that junta is now completely beholden to the Muslim Brotherhood. As for Jordan, again thanks to the US's support for the Muslim Brotherhood and its aligned groups in Libya and Tunisia, the Hashemite regime is seeking to cut a deal with the Jordanian branch of the movement in a bid to save itself from Mubarak's fate. Under these circumstances, there is no gesture that Israel can make to its neighbor to the east that would empower King Abdullah to extol the virtues of peace with the Jewish state. Panetta argued that an Israeli military strike against Iran would lead to regional war. But he failed to mention that a nuclear armed Iran will lead to nuclear proliferation in the Arab world and exponentially increase the prospect of a global nuclear war. Rather than face the dangers head on, Panetta's message was that the Obama administration would rather accept a nuclear-armed Iran than support an Israeli military strike on Iran to prevent the mullocracy from becoming a nuclear-armed state. Clinton's and Panetta's virulently anti-Israeli messages resonated in an address about European anti-Semitism given last week by the US Ambassador to Belgium Howard Gutman. Speaking to a Jewish audience, Gutman effectively denied the existence of anti-Semitism in Europe. While attacks against European Jews and Jewish institutions have become a daily occurrence continent-wide, Gutman claimed that non-Muslim anti-Semites are essentially just all-purpose bigots who hate everyone, not just Jews. As for the Muslims who carry out the vast majority of anti-Jewish attacks in Europe, Gutman claimed they don't have a problem with good Jews like him. They are simply angry because Israel isn't handing over land to the Palestinians quickly enough. If the Jewish state would simply get with Obama's program, according to the US ambassador, Muslim attacks on Jews in Europe would simply disappear. Gutman of course is not a policymaker. His job is simply to implement Obama's policies and voice the president's beliefs. 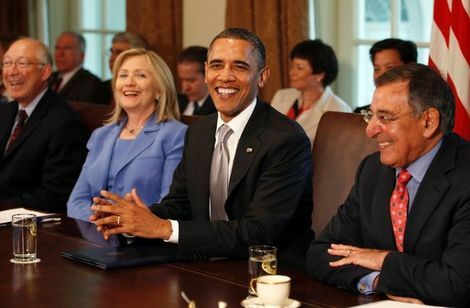 But when taken together with Clinton's and Panetta's speeches, Gutman's remarks expose a distressing intellectual and moral trend that clearly dominates the Obama administration's foreign policy discourse. All three speeches share a common rejection of objective reality in favor of a fantasy. In the administration's fantasy universe, Israel is the only actor on the world stage. Its detractors, whether in the Islamic world or Europe, are mere objects. They are bereft of judgment or responsibility for their actions. There are two possible explanations for this state of affairs - and they are not mutually exclusive. It is possible that the Obama administration is an ideological echo chamber in which only certain positions are permitted. This prospect is likely given the White House's repeated directives prohibiting government officials from using terms like "jihad," "Islamic terrorism," "Islamist," and "jihadist," to describe jihad, Islamic terrorism, Islamists and jihadists. Restrained by ideological thought police that outlaw critical thought about the dominant forces in the Islamic world today, US officials have little choice but to place all the blame for everything that goes wrong on the one society they are free to criticize - Israel. The second possible explanation for the administration's treatment of Israel is that it is permeated by anti-Semitism. The outsized responsibility and culpability placed on Israel by the likes of Obama, Clinton, Panetta and Gutman is certainly of a piece with classical anti-Semitic behavior. There is little qualitative difference between accusing Israeli society of destroying democracy for seeking to defend itself against foreign political subversion, and accusing Jews of destroying morality for failing to embrace foreign religious faiths. So too, there is little qualitative difference between blaming Israel for its isolation in the face of the Islamist takeover of the Arab world, and blaming the Jews for the rise of anti-Semites to power in places like Russia, Germany and Norway. In truth, from Israel's perspective, it really doesn't make a difference whether these statements and the intellectual climate they represent stem from ideological myopia or from hatred of Jews. The end result is the same in either case: Under President Obama, the US government has become hostile to Israel's national rights and strategic imperatives. Under Obama, the US is no longer Israel's ally.